Vernon Volumes: Connor - Ninja Warrior! 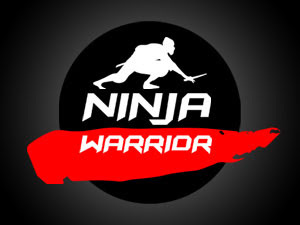 Connor's really in to Ninjas lately and he and Daddy watched the show "American Ninja Warrior" recently. He really loved watching the guys try to get through the obstacle course and has been trying to do cool ninja moves at home. Yesterday he was doing cool jumps from the couch to the ottoman in the living room. He did a few good ones, but then tried to get too fancy and fell on his face in the carpet. Ouch! He also tried to get dressed up like a ninja. He found some black socks in his drawer and put them on. At night time he dressed up in a long sleeve and long pant pajama. Probably a little hot. He asked me if he looked really cool and I had to admit that he did. Super cool! At story time, Daddy came up with a great idea to use Connor's motorcycle guys as Ninjas and we put together obstacle courses with his blocks. It was Connor's favorite story of all time. He said that he only wanted to do that story from now on forever. This morning we set up some more obstacle courses and I decided to snap a few pictures. Connor with his motorcycle guy NINJAS!